Perfect with a cup of tea or mug of coffee. 1 large cup of dried cranberries, rehydrated in 2 tablespoons of brandy and 1 tablespoon of tea (I had some cold English breakfast tea left over from brekkie). In a small saucepan, heat up your brandy and tea and once your liquid starts to boil, turn the heat off and drop your cranberries into it. It’ll soak up all the liquid! Preheat oven to 180 degrees celsius and grease/line a loaf pan. Sift the flour and baking soda and leave in a bowl to one side. In a large mixing bowl, beat the eggs with an electric mixer or use the whisk on your stand mixer – beat/whisk on high until fluffy. Add the melted butter and beat until combined. Add the vanilla essence, almond essence, salt and cinnamon. Beat until thoroughly mixed. Add the sugar and keep beating. Turn the mixer to a lower seating a gradually add the flour and blend until smooth. The batter will be very thick, as long as it’s not clumpy, you’re fine! Turn the mixer off and switch to a wooden spoon or spatula. 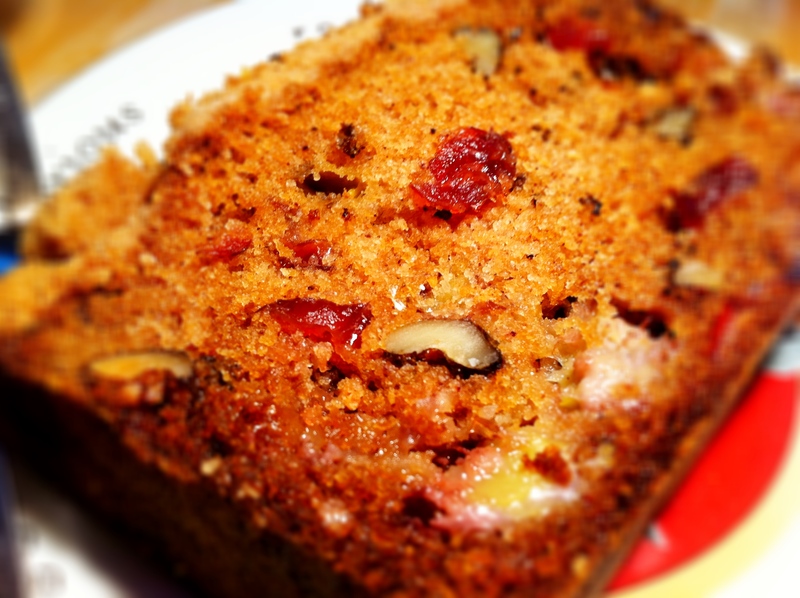 Add your cranberries, banana and walnut and mix thoroughly into your cake mix. You might think you haven’t made enough cake mix but that’s normal. Spoon your cake mixture into your loaf tin and leave it aside while you make the topping. Combine all the ingredients for your topping and rub the butter into the flour and sugar. They may not resemble the usual coarse breadcrumbs and make be a little tackier because of the butter. Don’t worry as they’ll work just fine. Evenly spread your topping mixture over the top of your bread. Pop this into the oven and bake on the centre shelf for an hour. Do let your cake cool for at least 5 minutes before you move it to a rack to cool down. It’s a bit tricky to cut when it’s still warm so if you want perfect slices, let it go cold before you cut.